As part of the larger rethinking project of the Gropius Bau spearheaded by its new director, Stephanie Rosenthal, Studio Miessen is responsible for reimagining and designing the institution spatially. The project includes the redesign of the foyer and lower ground floor, the Lichthof, the exhibition spaces, the bookstore, as well as strategies for how to move through the building and the way in which ticketing and logistical aspects can have an effect and affect on the audience’s perception of an institution. As new director of Gropius Bau, Stephanie Rosenthal will reimagine the role of this Berlin landmark in light of the building’s history as a place of vital artistic creation at the heart of cultural exchange. ‘The Gropius Bau stands at the border that once divided Europe, the physical embodiment of differing ideologies, and in our own time this symbolic position takes on a new resonance’, Rosenthal says. ‘My aim is to explore the building’s unique history and location, creating a new space to inspire local and international visitors using innovative exhibition formats’. Over the coming months a series of architectural interventions under the supervision of Studio Miessen and Andreas Lechthaler will make the building more light-filled and welcoming, expanding the beautiful atrium to become a freely accessible space open to the public with a new restaurant and a redesigned Walther König bookstore, while a new day-ticket scheme will make it possible to explore all the building’s shows and visual perspectives in a single visit starting next year. The Gropius Bau is one of Europe’s most important exhibition venues. With its acclaimed contemporary and archaeological exhibitions, the Gropius Bau has consistently opened up new realms of experience and established its international reputation. 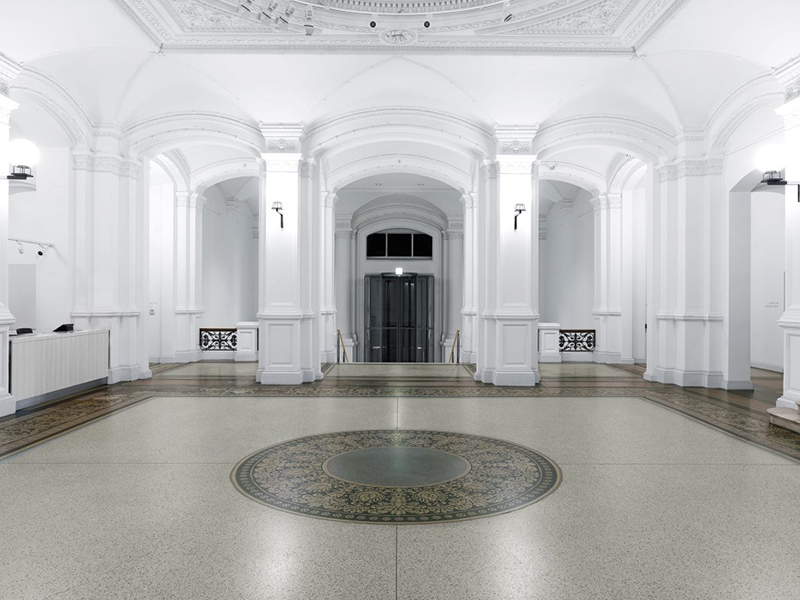 The Gropius Bau stands for a perceptive and varied examination of the exhibition venue’s history and its present day identity. In 1881, the Gropius Bau opened as a museum of decorative arts. 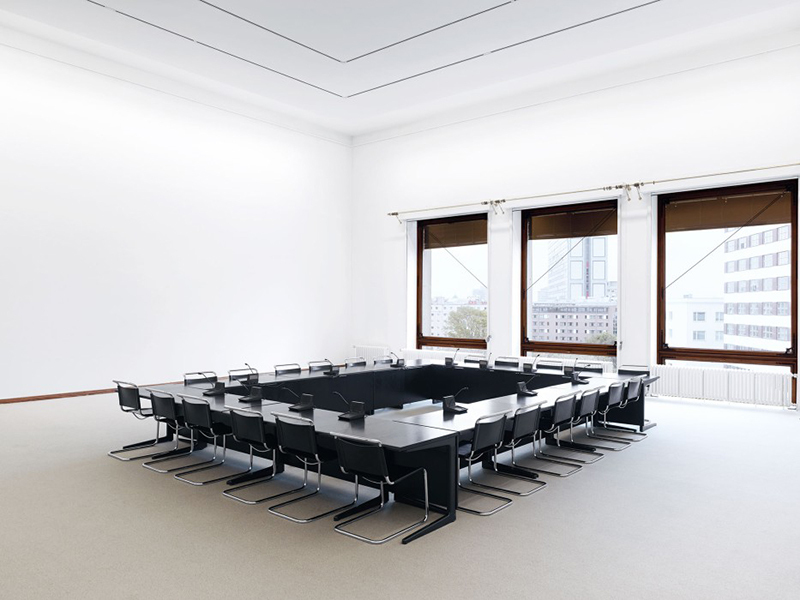 Designed by Martin Gropius, in close cooperation with Heino Schmieden, the building was developed with architect Karl Friedrich Schinkel’s fundamental design principles in mind. The Renaissance-style building served as the venue for various institutions and collections. 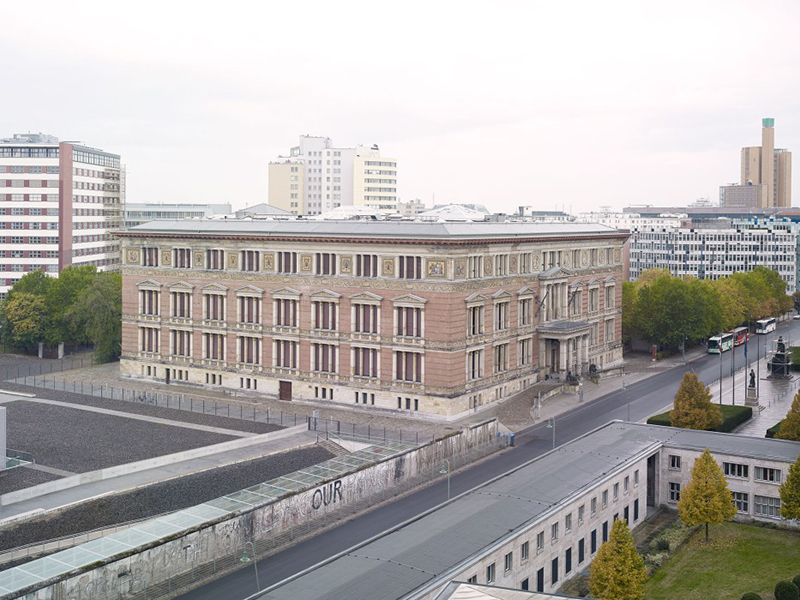 In the years before 1945, the Museum of Decorative Arts and the School of Decorative Arts, Museum für Vor- und Frühgeschichte, the Ostasiatische Kunstsammlung des Völkerkundemuseums and the Kunstbibliothek were located here. After 1986, the Gropius Bau served as temporary headquarters for the Berlinische Galerie, the Werkbund-Archiv – Museum der Dinge and the Jewish department of the former Berlin Museum. In 1945, the building was heavily damaged during one of the last major bombing raids on Berlin. The north facade and the upper floors were almost completely destroyed and the museum holdings in the cellar were burned. The planned demolition of the ruin was halted by the actions of the Prussian Cultural Heritage Foundation and Edwin Redslob, the co-founder of the Free University of Berlin, as well as interventions by Bauhaus founder Walter Gropius. The Gropius Bau was ultimately designated a historical landmark building in 1966. Reconstruction began in 1976 and it was officially reopened in 1981, at that time in the form of a raw building shell. Because it was situated directly on the Berlin Wall, the entryway to the building had to be relocated from the former main portal on the south side. The new main entrance finally reopened ten years after the fall of the Berlin Wall in its present location on Niederkirchnerstraße.